Amazon, Alibaba, and others tout staffless stores as the future of retail experience. There are hardly a handful of stores launched worldwide. But I think that before thousands of such stores are rolled out, there could be a wave of another type of store or retail experience that has the potential to disrupt the staffless stores themselves. A bold retailer that wants to pick up the gauntlet and take the fight to Amazon’s door would be able to do so if they think it through. The basic premise of the staffless store is that customers don’t want to wait, they are pressed for time, and hence the tag line “just walk out”. This is reflected in the kind of merchandise sold in store. Customers value speed, convenience and personalization. Trying to extend this concept to standard grocery shopping has proven to be difficult. The weekly run to the grocer is still a necessity for most families. It is a deeply ingrained ritual in the North American psyche. Grocery shopping in store allows selecting fresh produce to measure. The colors, sights, smells, and taste enhance the experience. The very presence of people adds to the experience. The serendipitous discovery or the chance to try something new plugs into the variable reward mechanism of the brain. However, the stores of today need customers to take the items off the shelves and deposit them into baskets or carts. These are paid for at the exit and carried home in their vehicles. This is a very important point. It is also one of the major reasons given by most transportation companies trying to build alternative mobility solutions, for why they are unable to build smaller vehicles – the need for space to stow the weekly shopping, or any other kind of shopping for that matter. Think about what all of this entails from the retailers point of view to enable shopping in store. Large amounts of inventory, estimating and predicting demand, and lots of wastage. Now imagine a future where buying something does not mean having to carry it out with you, unless of course you want to. Just point and/or click on an item in store and it will be delivered to your destination of choice, at a time of your choice, automatically. Not only does this allow speed and convenience for regular shoppers, but think of how simple this will make lives of differently abled people, or even those that are temporarily incapacitated due to hurt or injury. This offers the best of both worlds – customers are able to get the full benefits of shopping in store while not having to worry about how the goods will be delivered. For the retailer this means minimizing the amount of inventory in store. All deliveries are carried out of dispatch points or warehouses spread throughout the city. Deliveries could eventually be made by autonomous vehicles or drones or by people as now. Retailers will not only have to rethink the shopping experience, but also the entire supply, delivery, and fulfillment chain. I believe that just automating the checkout function in a store is not sufficient. It is a necessity. That function will still need to exist. But retailers will soon have to go above and beyond that. Many stores offer delivery service today, but usually the service is prohibitively expensive and very few customers seem to take advantage of it unless there is a compelling reason. Moreover, retailers still need to stock their shelves and customers still need to fill up their shopping carts. I think that the technology already exists to make smart shelves that allows this kind of seamless shopping experience. It will probably be easier to implement than using hundreds of cameras and computer vision to track people and activities in the store. 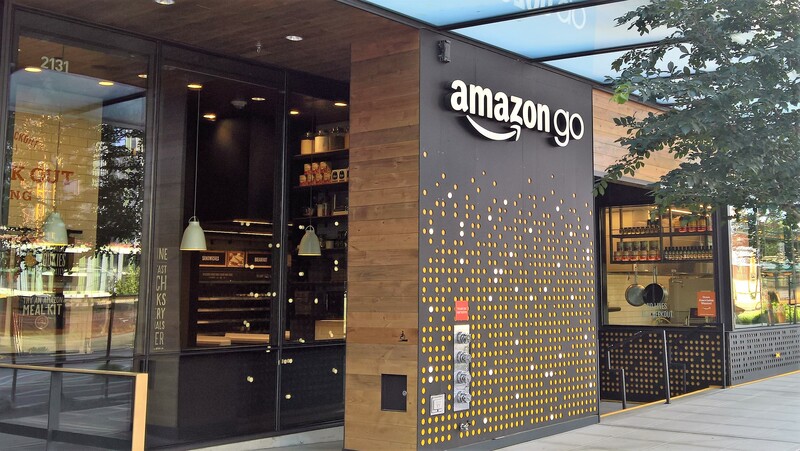 Both Amazon Go and Alibaba Tao Cafe need customers to have mobile apps, registered profiles, and payment methods set up to shop at the stores. The next wave of retail innovation should eliminate the need to carry the goods. Shopping online and offline should blend into one another. It should be the same 1-click shopping experience irrespective of where you buy. Imagine the possibilities this opens up. Customers arrive on their micro mobility transport of choice, shop, entertain, eat, and drink; safe in the knowledge that the goods they’ve paid for will be waiting for them when they return home. Malls and department stores regain their allure because now they offer possibilities for great experiences. Parking and congestion become less of a problem due to smaller vehicles, ride hailing, car sharing, and freely available public transportation options. It remains to be seen which enterprise will be the first to make this bold move towards retail utopia!